This Paula Deen Banana Pudding Recipe is very close to my heart. I make it every Easter and for BBQs and family events. 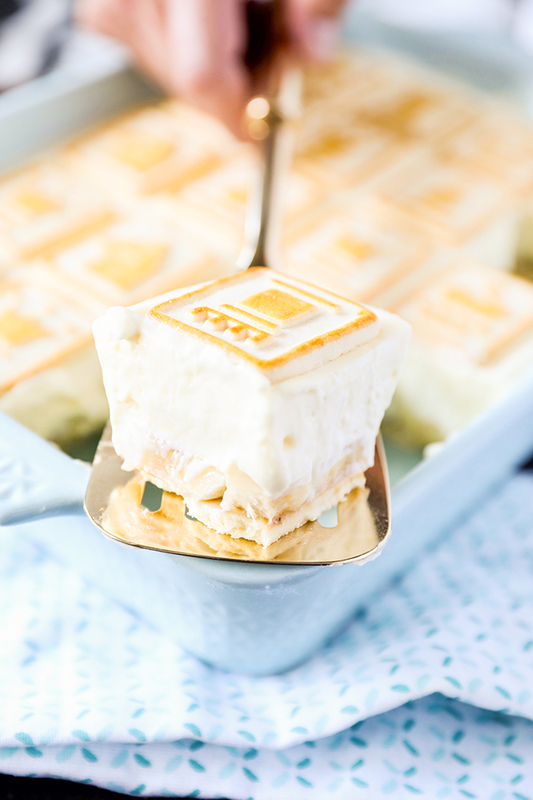 Hands down, the very best part of this banana pudding is the texture. It’s so thick and creamy. You can serve it sliced instead of scooped. The Chessmen cookies are amazing in this recipe too. They hold their shape and make for perfect portions. If you take this to a party, make sure you print off a few copies of the recipe, because people are going to ask! This is originally a Paula Deen recipe, but I’ve made it so many times that I have some important tips and tricks I want to share with you! 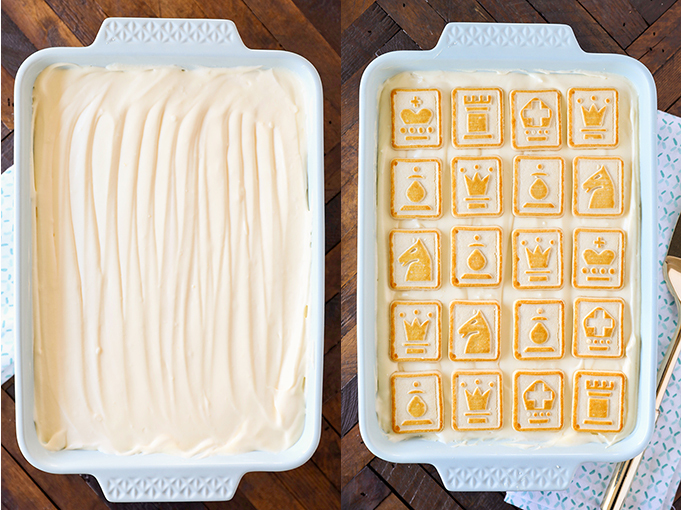 This banana pudding is a classic and sure to be a hit for any celebration. My first tip is to buy 3 bags of the cookies even though you only really need two. Buy three bags because very often these cookies are broken. If I have a few broken cookies, that’s ok. I just arrange them in the bottom layer as pictured below. But more than once, I haven’t had enough unbroken cookies for the top layer. I also double check the expiration dates in the store. Right now, they have the spring version in stores which are fresh, but the traditional chessmen in both my grocery store and at Target were just one day from expiration. Second, prepare the pudding mixture before slicing your bananas. This cuts back on the time the bananas are exposed to air. 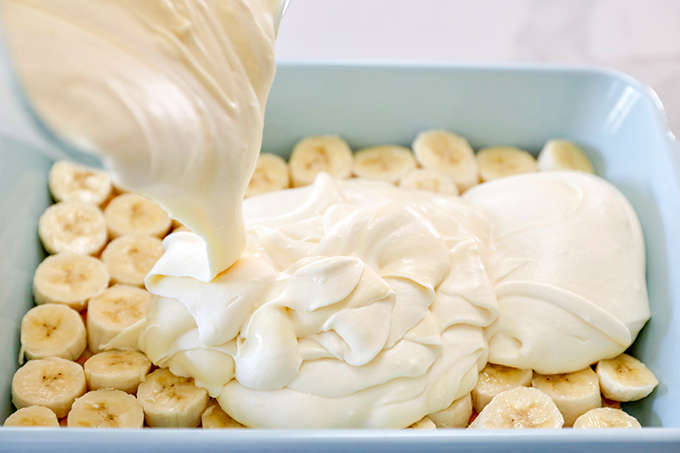 I also like to use fresh bananas rather than overripe bananas in this banana pudding recipe. The firmer texture is a nice contrast to the soft pudding. The pudding mixture is the absolute star of this recipe. The original recipe calls for Cool Whip with a note that you can substitute with homemade whipped cream. I recommend substituting with homemade whipped cream that has been only slightly sweetened. I’ve included instructions for the homemade whipped cream and taken care of the measurements in my version. I’ve also tried to streamline the steps. One of my favorite parts of this Paula Deen banana pudding recipe is the addition of cream cheese to the mixture. You can’t taste the cream cheese, but it makes for a really amazing thick and smooth texture. For the final layer, I have found that the best way to arrange the cookies is to fit them vertically in a glass baking dish. Four cookies across and five down. Evenly space them, then fill in the rest of the cookies so they make a lovely grid pattern. 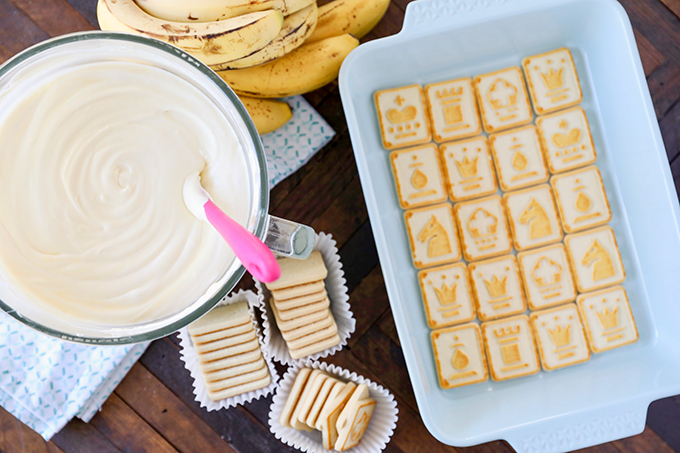 I use the cookies to measure portions and get twenty servings from each banana pudding recipe. In the bowl of a stand mixer, whip chilled cream, sugar and vanilla together until soft peaks form. Measure out 3 cups of whipped cream and refrigerate remaining whipped cream to serve as topping. In a small bowl, whisk together pudding mix and two cups of milk. Rinse the bowl of the stand mixer and using paddle attachment, beat together softened cream cheese and sweetened condensed milk until smooth. Add pudding to stand mixer and continue to stir until combined. Then, gently fold in 3 cups of homemade whipped cream. Line bottom of 9x13 casserole dish with 20 Chessmen cookie. 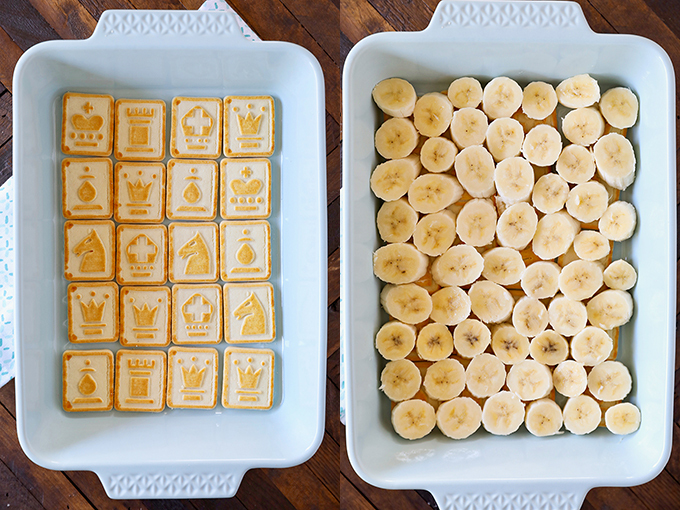 Slice bananas and arrange over cookies. Spread pudding mixture over bananas. Finally arrange another layer of 20 Chessmen cookies on top of pudding mixture. Cover and refrigerate for 2-3 hours or until chilled through. Serve with additional whipped cream if desired. I make this all of the time also and it is a big hit. I totally agree with your “cookie hint.” From past experience of broken cookies, I always open all of the cookies and save the best for the top. I know there is nothing you can do, but its so frustrating seeing all these smashing recipes that we Europeans cant make because we dont have things like Chessmen Cookies or Jello Instant Pudding! Obviously no one is going to put that in a subtitle. Be creative and make your own substitutes such as custard instead of pudding, and use any cheap vanilla cookie instead of the ones mentioned. Would you like for me to mail you some Chessmen cookies? Jello-pudding is just a basic cornstarch (corn flour) pudding. So 2 cups of whole milk, 1/2 cup sugar, 3 tablespoons cornstarch/corn flour, dash salt, 1 tsp. vanilla. What I do is mix the dry ingredients, and add the milk into a big glass bowl…and then nuke it for 2 minutes….whisk…nuke again….whisk…until it is firm. Takes about 6-8 minutes. Add in the vanilla at the end. Can also heat on the stove and stir until thick. Can you order the ingredients online? 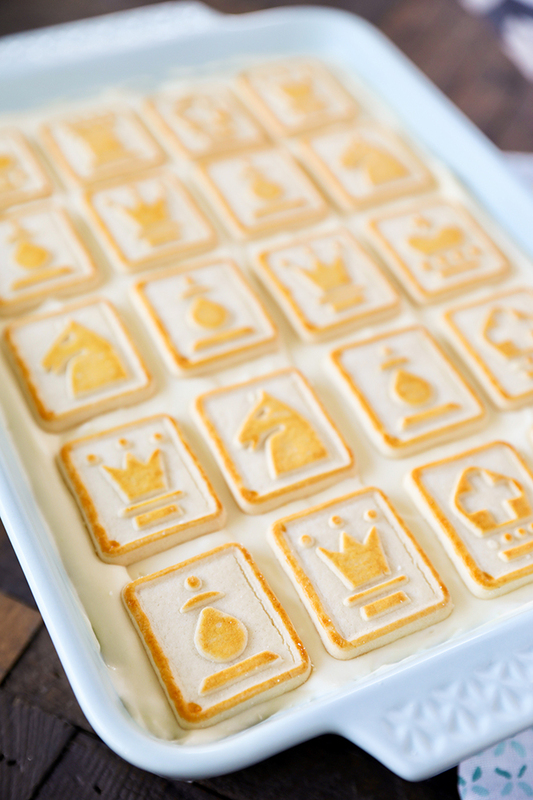 Chessman cookies are kind of a sweeter version of a shortbread biscuit. You could use any shortbread biscuit (maybe even a chocolate biscuit) instead of the cookies. Another person’s suggestion of using a custard instead of the pudding is also a great idea. I prefer English custard to American pudding in general because because I think American puddings are too sweet. It is not really practical to put something like “USA ingredients” because we have no idea what is and is not available in your country. On peut peut être utiliser une préparation pour crème pâtissière? le résultat semble identique .Pour les cookies des thé lu ou autre. Il faut adapter et ne pas capituler!!! Je vais essayer, je vous dis le résultat. I would try adding some extra sugar to Birds custard and use shortbread cookies. I’ve made this recipe for many years – it’s a keeper. Always a hit at potlucks, reunions, BBQs. And I have to say that while mine is always well received it never looks as nice as the one above. Like you, I use whipped cream instead of Cool Whip. I also use French Vanilla pudding instead of just plain vanilla. I did experiment once with cheesecake flavored pudding and wasn’t impressed. I recently saw a version with strawberries instead of bananas and may give that a try later this summer. I just recently discovered your website and already plan to try the one pan chicken alfredo for dinner tonight. Can’t wait to see what other goodies are in store. Hi! I have been making this PD recipe for years. I love how yours has turned out. How did you get the pieces to cut so perfectly? Mine is always very sloppy once served. Thank you! Thanks for the comment! Mine always comes out very thick, which is why I love it:0) You might compare this recipe to your original one. I make a few changes, so that might be the difference! 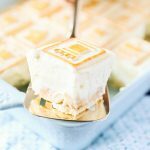 Has anyone ever used banana pudding instead of vanilla? Instead of the 5.1oz box of Vanilla I use 1 small 3oz box of French Vanilla and 1 small 3oz Banana Pudding. Instead of 2 cups of milk I do 3 cups to make up for the extra small box. I love it and so does my family when I do it this way. I am planning to make this for Easter brunch. Looks amazing! Do you think it would be okay to make the night before? Yes, the night before works fine! Happy belated Easter! have you made this and let it sit overnight before serving? Or is that too long? I’d like to try it for Easter lunch tomorrow but will not have time to make in the morning. Hi Lacey! The night before should be fine! Just make sure to keep it refrigerated! I made this the night before Easter and served it Easter morning. I put it in the freezer about an hour before we had to leave so it would be nice and cold for the drive. It held up perfectly and I was able to slice it as pictured above. The cookies did sink a bit along the edges. This was extremely delicious and everyone loved it! Thank you for the recipe!